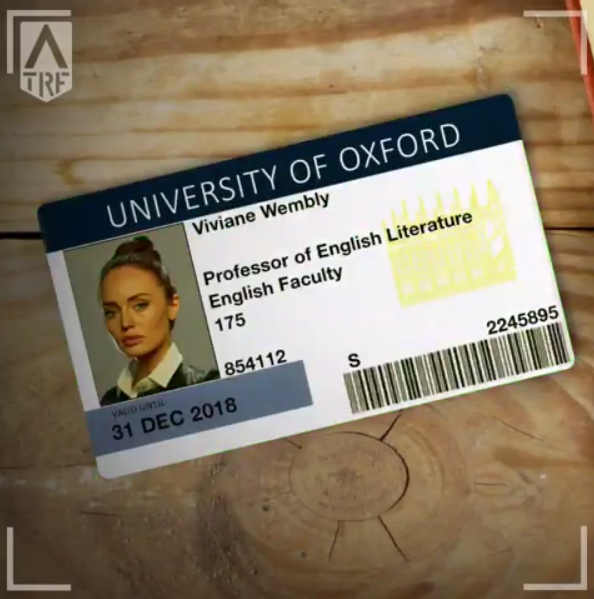 The official Transformers Facebook page has posted a new character profile for Viviane Wembly in Transformers: The Last Knight. It looks like the Transformers Reaction Force was snooping around her desk and scanned her University of Oxford ID. The Facebook video can be viewed after the jump. So instead of Squeeks, it's Sqweeks. Now it's Viviane Wembly instead of Vivian Wembley. I think that they officially introduced Sqweeks as Sqweeks (they even added a "good luck with auto-correct" in the comment). Is this the first official outing for Viviane? In story description she's introduced as an Oxford Professor. I don't remember them dropping any official info on her character besides this ID card. Perhaps the random misspelling in all the interviews comes from the similarity of Viviane and Vivian when spoken? When I saw the name Wembly I thought of this. Who poses with their shoulders like that for their work ID? I know. Between that and the unorthodox spelling of her name, the movie is completely ruined. UPDATE: I will give them credit though. It is based on the actual Oxford ID card. But I'm wondering if she would be listed as Professor. She looks really young to be hold a Professor rank (which is for senior faculty). She should probably be a lecturer, reader, or associate professor. (If you put her at Laura Haddock's age, which is 31, then she probably has only had her Ph.D. for about three years. Maybe she was a child genius and wrote a really, really, really provocative doctoral dissertation on Transformers as a teenager?). Wasn't her character's name just "Izabel?" I don't even know, but I remember it had a strange spelling. And Isabela Moner's character is named Izabella with a Z.
I don't know why, but when I saw her badge I remembered Hot Rod in the clip saying "Little Lady no Ohh …. she's very complicated"
Well, that sure was an in depth character profile. After the trailing focusing on Isabella, I thought this movie might be making progressive strides towards females … but that photo makes me think her entire character is \"strict librarian who learns to relax and let her hair down.\"